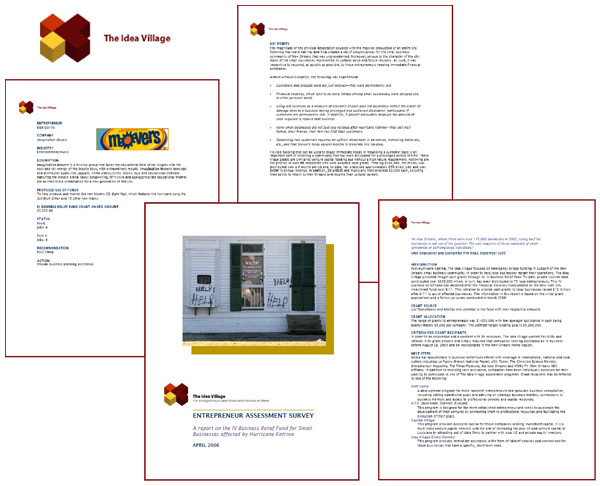 Produce a report that summarizes status of individual companies who received assistance from The Idea Village either in the form of cash grants (post-Katrina) or through programmatic support. The Idea Village is a non-profit whose mission is to cultivate and promote a culture of innovation and to provide focused tools and resources necessary to accelerate the development of entrepreneurial ventures based in New Orleans. The Idea Village assists businesses by providing in-depth consultation, including setting operational goals, advising and consulting on strategic business matters, connecting entrepreneurs to business mentors, and by facilitating access to professional services and capital resources. Provide strategic input with regard to questionnaire content and recommendations for audit format. Coordinate with partner consultant on process clarification. Interpret data for programmatic recommendations. Write executive summary, report and supporting rationale and provide document formatted for production.